Sacrifice and forgiveness were talked up today by Fiji's illegal leader when he referred to the deaths of three soldiers in the 2000 mutiny at the Queen Elizabeth barracks. FijiVillage says Voreqe Bainimarama welcomed a 50-strong male delegation from the District of Lovoni in Ovalau, who presented their "mata-ni-gasau". The website says the group represented six villages namely - Lovoni, Vuni-ivi-savu, Nasau-matua-i-colo, Nukutocia, Visoto, Nacobo and were led by the Turaga na Tui Wailevu, Ratu Beranaitutu Rogoyawa. Bainimarama is quoted as saying the people from the district had done a number of things that brought instability in 2000 and he's happy they've realized how wrong their actions were. The junta leader, who has been fending off talk of current unrest, says the three soldiers made the ultimate sacrifice to bring peace to Fiji, and he hopes people now understand the country should never go back to the dark days of 2000. Original story and picture from Fiji Village. Note: See earlier FijiVillage story on the commemoration service and Bainimarama's claim the RFMF is stronger than it was in 2000. What a load of crap. I am getting tied of hearing the so called dark days, how about some bright days for a change. Fiji is in the dark days already and they will get even darker ! What is Voreqe talking about when he mentions the dark days of 2000? That coup only lasted 56 days and pales in significance to his current misguided coup which is approaching its fifth year of darkness. 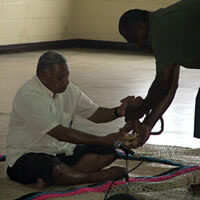 These people from Ovalau should be ashamed of themselves for presenting their matanigasau to a criminal. By doing this they are perpetuating the coup by giving the dictator the legitimacy he craves. What has happened since 2006? From the democratic society of 2006, Voreqe has forced his evil and totalitarian regime on the country. This evil junta has transformed a vibrant and open society to one of fear and the harsh suppression of civil rights. There was the destruction of the constitution, the independence of the judiciary; there is still a muzzling of opposition voices, strict censorship, arbitrary arrests, jail for those who oppose him and the denial of proper defence. People live in fear and others compromise their standards to get ahead whilst they sacrifice the freedoms of others including that of their children. Though the majority are silent, they disagree with this coup and are pressured into conforming to the regime. By always condemning the 2000 coup Voreqe is portraying him to be the "messiah" of Fiji. This is a cunning and evil strategy of trying to sell a new social contract with the people. This contract contains a sublime message that, we the people should leave matters of politics to the regime as long as we live in silence. But this deal is not acceptable to intelligent human beings. To be deprived of your freedoms is to be deprived of your identity. Voreqe is a liar whose words can never be trusted. In 2006, he promises the people of Fiji and the international community that there would be no coup, but he did one. After the coup, he promised that the freedoms of individuals would be respected but he harshly suppressed them. Then he promised that not one soldier would benefit from it but look at them now. Then there was the promise of a quick return to democracy in 2006 but they have greedily held on to power for five years now and indefinitely into the future. Then there was a promise of elections in 2010 but he was not sincere. Sorry Voreqe but stop feeding us all that bull because you are a liar and your regime is the worst thing to befall Fiji. Bainimarama must be doing something good for Fiji, the Americans are coming back to support and have their base in Suva the USAID that is. For some fifteen years they went walk about now regales of the coup they’re back. Welcome home my fellow Americans. What he didn't mention was these 'dark days' our self proclaimed leader is refering to lie in his (& his compatriots)- not to distant future. Looming Sugar crisis is one of epic propotions - loss of international confidence in Viti's banking system over blatant theft of $200ml from RBF not helping eitheir - land bank proposal (nationlisation) will achieve exact opposite - creating festering social conflict. Viti can no longer afford him or them - both monetarily or morally. Nah u wrong and way off the mark. They are coming for the people not the budy government. Who wants Americans Jake? We don't, we would rather have the Chinese.